Disclaimer: This is sort of a long one that gets a little off topic (very unusual for me, right?!). If you can make it through, you definitely deserve a pizza. For that reason I have created a TOC so you may skip ahead. So anyway, I went to Paris the other day, because, you know, why not. While I was there I had the opportunity to talk shop with a friend of mine who is also a self-proclaimed amazing chef. While I don’t have firsthand evidence of his skills, I do take his word for it because he is tall and French and speaks in an authoritative manner. And then also of course we all know that the French can never be mistaken when it comes to food. On this occasion we were talking about pizza, as you do, which was a little ironic because France is actually not known for excellence in this category … or perhaps it’s totally un-ironic because if you want to have good pizza in France you must obviously make it yourself. This is not dissimilar to my problem in Philadelphia when it comes to Mexican food. But that’s another rant story. Anyway, my friend shared with me that he always makes his own pizza but he uses sauce from a jar. Nothing against jar sauce, and if you have a good one you like, please let me know – however, I am picky about sauce so I usually make it myself. 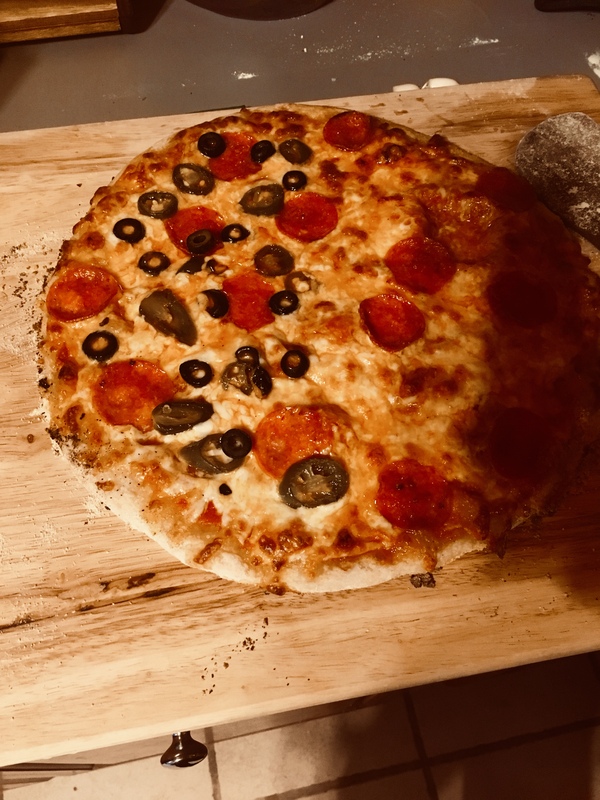 Inspired by this recent conversation, I decided it was time to share my pizza recipe, from dough to sauce to cheese and everything in between. If you want proof points for why it’s good, I can offer up the testimonial from my son “I like Mom’s pizza better than order-out pizza.” In my house there is no higher praise than that. So here I am doing my part to bring quality pizza to people all over the world. Before we get started, IMPORTANT NOTE: The key to keeping homemade pizza a reasonably practical dinner option is to spend the time to make the dough and sauce in a big batch, and then freeze it for assembly on demand. This recipe assumes that basic strategy. ALSO: Once you have made all the things, skip to the end for how to combine them into a pizza. I have some bad news for you, this is going to take a couple days if you want it to be really, really perfect. If you don’t mind it being only mostly perfect, it doesn’t take long at all. In actuality, the time that you are actively working on it is about 20 minutes, but there is a lot of resting the dough and punching it down and resting it again, etc etc etc. So, this is my preferred method but feel free to use THE SHORTCUT (see below). Punch it down and return to oiled bowl, covered. d. What is happening during this time period? Some chemical process is taking place with the yeast and the gluten and it leads to a chewier crust. This is how I like it. Others might prefer it another way. No judgment on my part, however if you ever feel your pizza crust isn’t chewy enough, you should try it this way. e. Once the dough has risen and re-risen enough times, divide it into three, drop it into three storage containers (I use Ziploc bags and I usually label them with the date because I’m meticulous like that). THE SHORT CUT: If you want to take the short cut, all you have to do after step 7 is punch the dough, divide it into 3 equal portions, place in 3 oiled bowls lightly covered with a damp towel or plastic wrap, let them rest one more hour and then place in separate containers to freeze. Now you have your dough, so let’s move on. Quoi d’autre? Que mas? Cos’altro? What else? This is easy so I will try not to waste too much time entertaining myself with unnecessary exposition. You will notice certain recurring themes if you happen to have read my Tomato Soup or Pasta Arrabiata recipe. This is because Italian tomato-based recipes all boil down to these 4 basic things – garlic, onion, tomatoes, seasoning. Proportions and cooking methods are the only variance. The cheese you don’t have to deal with ahead of time. Shred it right before you start the pizza. I shred about 3 cups per pizza. If I have feta, I may sprinkle it across the top after I’ve spread cheese over the whole pizza. Take one of the bags of dough out of the freezer and let it thaw on the counter for an hour or so. It won’t take long. If you’re in a rush, you can run warm water over it (keep it sealed in the bag). Preheat your oven to 500 degrees. If you have a pizza stone, place it in the oven before pre-heating so it doesn’t crack with a temperature shock. Take one of the sauce containers out and either microwave it or thaw it on the stovetop. Spread about a half cup of flour on the parchment and keep some more nearby in case you need it. Rub some flour on your hands and over a rolling pin and get ready to roll out the dough. With the floured rolling pin, roll the dough out to a thin circle – not too thin or the pizza will be soggy and fall apart. I usually roll it to about ¼ inch thickness – the pizza diameter will be about 9-11 inches. Now transfer the whole thing onto the pizza stone – parchment paper and all. I usually slide the pizza onto a pizza paddle and then slide it over to the stone (or baking sheet or oven rack – however you roll). Cook for 5 – 10 minutes depending on desired crust texture – I like mine a light golden brown and a little chewy. So, there you have it. Thanks for sticking with me through all that, and I hope you enjoy!